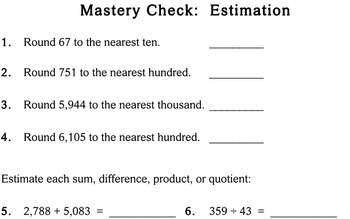 A set of 16 worksheets and a quiz on estimation of whole numbers (beginning with rounding), designed for fourth grade level. 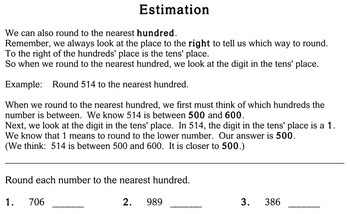 This set is nearly identical to the fifth/sixth grade set; the only differences are that in the 5th/6th grade set the font size is reduced slightly, the introduction to rounding is more compressed with a focus on rounding to places greater than a thousand, and a few extra questions with greater numbers have been added. Can be used in tutoring or as a resource with specific students who need more focused practice on the concept. May be used to quickly review concept or help student re-learn it. I recommend using different pages on different days so the student has to move information in and out of memory more. 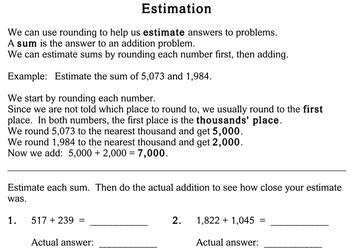 I created this to use with my tutoring students; if they're having difficulty with rounding or estimating, these worksheets always give them the practice they need to become successful with the concept! This set of worksheets was created by Destiny Woods. 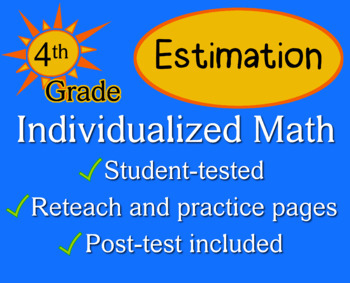 You can find more Individualized Math worksheets here. To see all my other products, visit my store. You can find this product (along with the answer key) included in my Individualized Math complete fourth grade bundle.